Registration will open this week for the 6th Annual Addison Jo Blair 5K Run/Walk which will be held on Saturday, May 21st in Glendale, KY. Once registration is open you will be able to register at www.active.com. We will let you know once the website is ready for registration to take place. Last year, our foundation did very well. In March Burger King did Rainbow Sales for foundation and raised $4,500. In September Cut-N-Up, Jones Home Center, Magness Primitives, Price Less Foods, and Sonora Farm Center sold rainbows and raised $3,100 for our foundation. We greatly appreciate all the businesses selling these rainbows for us and for everyone that purchased one. We truly appreciate your support! You can find our updated information under About the Foundation on the website. We had a great year thanks to each and every one of you!! This foundation would not be where we are today without all of the support we have been shown. We look forward to seeing everyone at the race in May!! God Bless! If you would like to contact us please feel free to send us an email at info@addisonjoblair.org. Registration is open for the 5th Annual Addison Jo Blair 5K Run/Walk which will be held on Saturday, May 16th in Glendale, KY. You can register at www.active.com. The Addison Jo Blair Foundation is extremely busy preparing for this event and we are so excited to be hosting this run for the 5th consecutive year. :) A huge thank you to Burger King for selling Addison Jo Blair Foundation rainbows this past month. Also, we thank each and everyone of you who purchased one at any of the Burger King stores. Your support is amazing and we appreciate it so very much. Our foundation would not be where it is today without the love and support from all of you. We look forward to seeing everyone at the race in May!! God Bless! 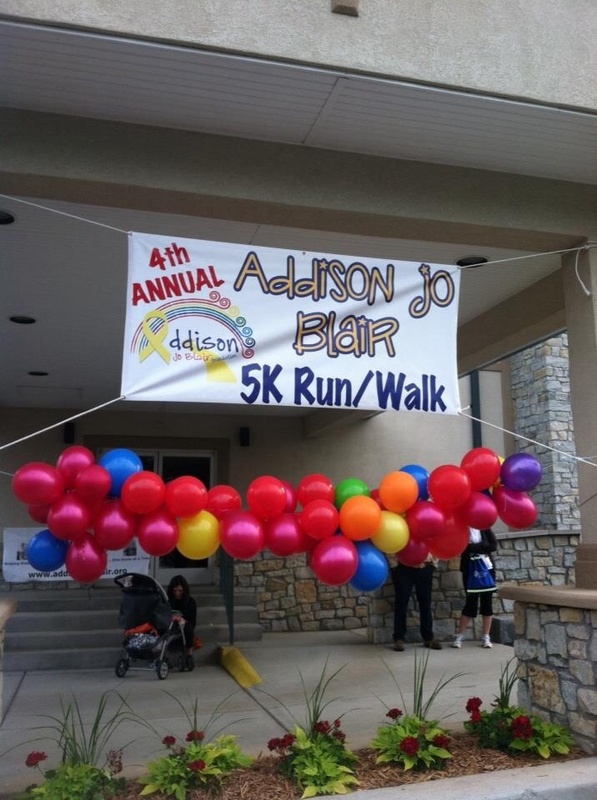 The 4th Annual Addison Jo Blair 5K Run/Walk was a huge success! We had 427 racers participate in this years event. We want to thank everyone who came our and participated as well as all of our sponsors/donors. The results of the race can be found at www.tristateracer.com. You will need to click on Results and then search for the Addison Jo Blair 5K. We do not have a grand total just yet of what was raised but we will in the coming days. Again, we thank everyone for all of your support and appreciate those who participated in this years event. We look forward to seeing everyone next year at the 5th Annual Addison Jo Blair 5K which will be held on the third Saturday in May. Registration for the 4th Annual Addison Jo Blair 5K is now open at www.active.com. The race will take place on Saturday, May 17th in Glendale, KY. Preregistration is from February 1st through May 2nd with the price being $25.00. After May 2nd, the price will go to $30.00. Everyone who preregisters will be guaranteed a dri-fit race shirt and goody bag. We will have the Kidzone again this year so bring your family out for this event. This is the foundations #1 fundraiser for the year and we look forward to another great turnout this year. Thanks again for everyone's support over the years. It is greatly appreciated! The Addison Jo Blair Foundation wants to wish everyone a Happy New Year! We thank everyone for your support in 2013. The foundation continues to support the Addison Jo Blair Cancer Care Center at Kosair Children's Hospital. The foundation has also helped numerous families this past year with gas and food gift cards as well as care packages. The foundation gave a donation to CureSearch to help with pediatric cancer research in order to help find a cure to this horrible disease. Our annual Addison Jo Blair Memorial Scholarship was awarded at Central Hardin High School to Jacqueline Carver. The Addison Jo Blair Foundation has been extremely blessed by such wonderful support from all of you. We thank you from the bottom of our hearts! Our sweet Addison above is so very proud that her legacy continues to help the many other children battling the horrible disease called cancer! We hope and pray that a cure is found soon so that children and families do not have to go through the pain of dealing with this monster. The foundation has started planning the 4th Annual Addison Jo Blair 5K which will take place on May 17th. Please mark your calendars now! :) There will be many more details to come soon. The Addison Jo Blair Foundation recently delivered several boxes of toys to Kosair Children's Hospital to be handed out to patients on the Addison Jo Blair Cancer Center. These toys were collected by Creekside Elementary Schools BETA Club students, staff and parents as well as toys donated by Paige Westwood. The Creekside BETA Club held a toy drive in honor of September being Childhood Cancer Awareness Month. Students created posters advertising this toy drive and there were many boxes filled with new toys to be given to patients at Kosair Children's Hospital battling cancer. We appreciate all the hard work and dedication that went into making this toy drive a success. We thank all the students, staff, and parents that made this toy drive a success. We also give a huge thank you to Paige Westwood who purchased toys and filled bags to be given to patients on the Addison Jo Blair Cancer Center at Kosair Children's Hospital. Many children benefited from the generosity displayed by everyone who donated these toys. THANK YOU from the bottom of our hearts! A big thank you to everyone who stopped by the Addison Jo Blair Foundation booth at Glendale Days on Saturday. We appreciate all the support we were shown. We want to announce the winner of the John Calipari autographed UK basketball as well the winner of the handmade, wood child picnic table. Donna Knott won the signed basketball and Layla Hawkins (Jennifer) won the picnic table. Congrats to you both!